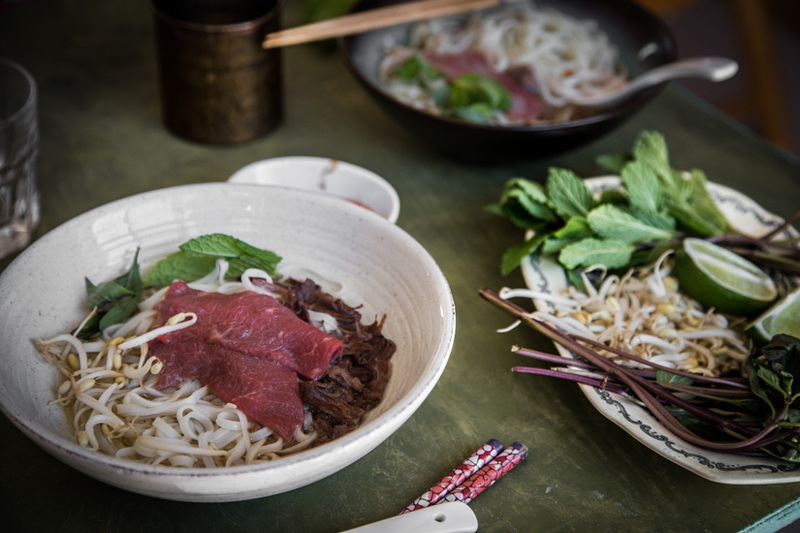 Pho Bo is Vietnamese thin rice noodle soup served in broth that is cooked for hours from bones and aromatic spices and served with slices of beef and fresh herbs at the side. 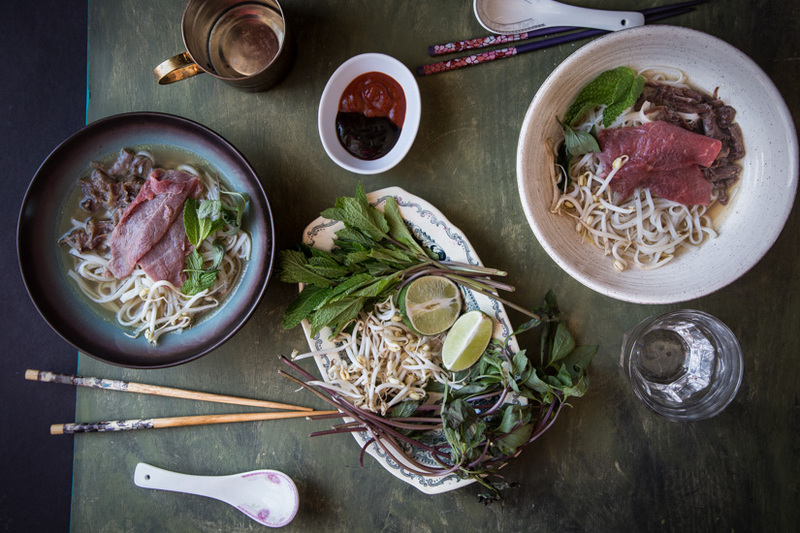 It’s hard not to love a good bowl of Pho Bo! One of my favorite Vietnamese dishes is Pho Noodles. 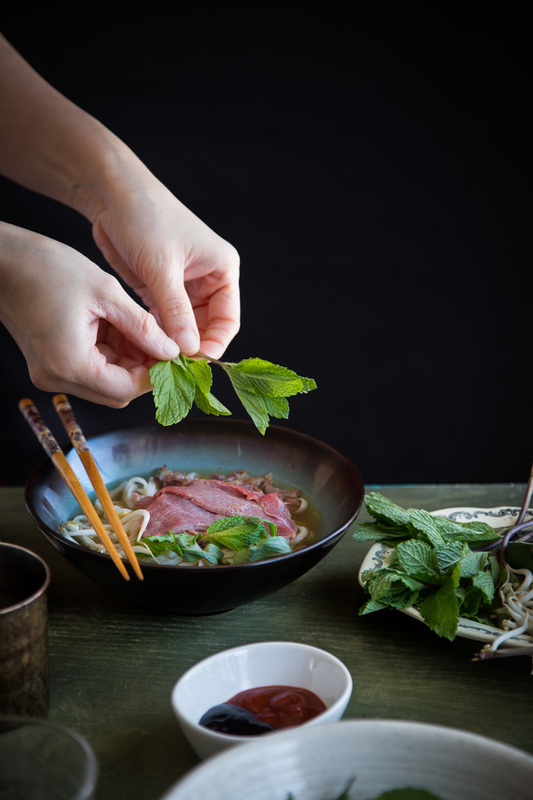 Pho is a Vietnamese noodle soup, usually served with beef (pho bo) or chicken (pho ga).The soup includes noodles made from rice and is often served with basil, lime, bean sprouts, and peppers that are added to the soup by the consumer. 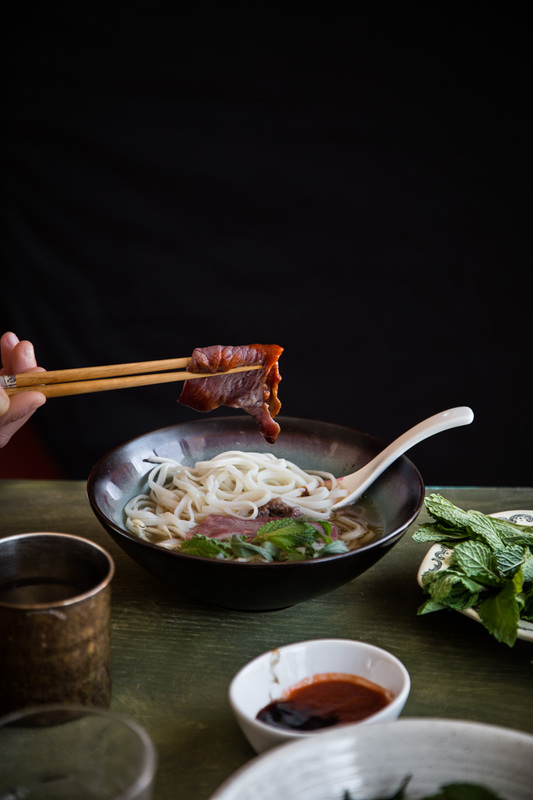 The key ingredient to a good bowl of Pho noodle soup is on the broth. 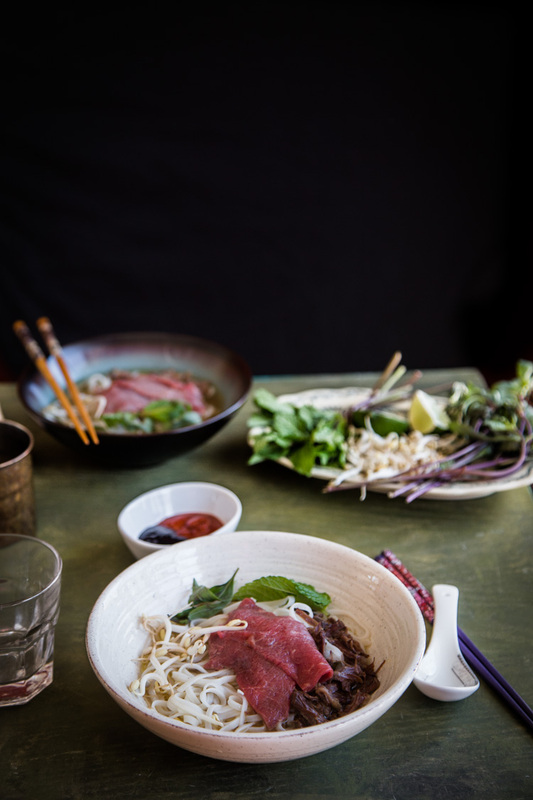 The broth of Pho Bo is generally made by simmering beef bones, oxtails, charred onion, charred ginger, and spices for hours. It took me about 3 hours to make the broth but it is so worth it. 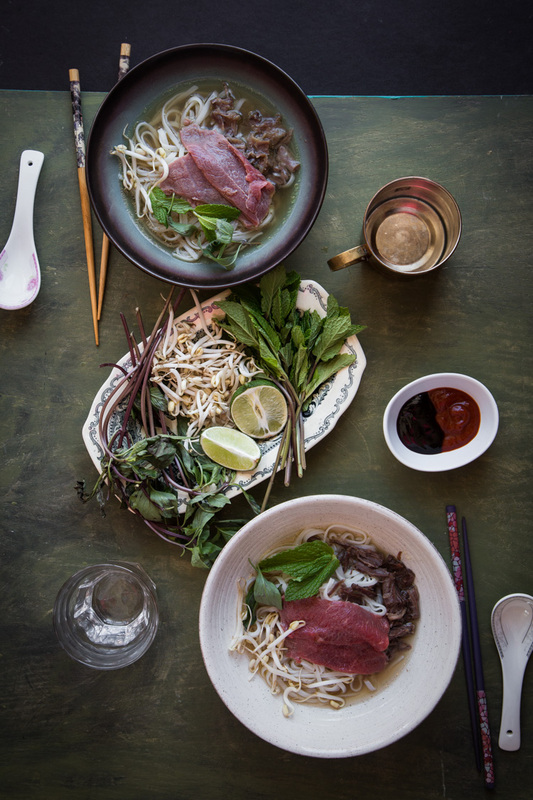 The Pho noodle itself can be brought fresh from the Asian store in their refrigerated section or in dried form. 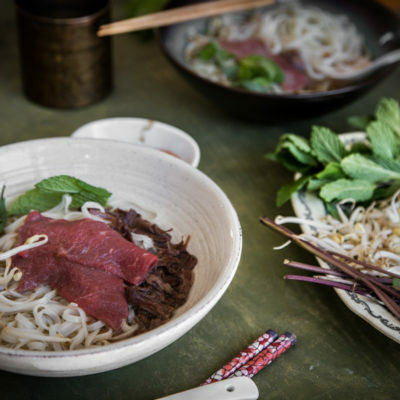 I got this Pho Bo (Vietnamese Beef Noodle soup) recipe from Into the Vietnamese Kitchen by Andrea Nguyen with slight modification. The key ingredient to making a good Pho Noodles is on the soup and this recipe does it for me. Strain the broth after 4 hours and discard all the stuff in there. I set aside the oxtails and pick the meat off the bones to serve with the pho later. Taste the broth and adjust with more salt, sugar or fish sauce if needed. At this point the broth is ready. Serve with fresh bean sprouts, basil, saw tooth leaves, lime and peppers at a side. You can also eat it with Hoisin sauce and Sriracha chili sauce.